There is really not much new to say about "Halloween" that hasn't been said before. Virtually every horror fan has seen this film and Michael Meyers has become somewhat of an icon. The plot is very simple and the film opens with a young Michael Meyers brutally stabbing his sister, Judith, to death on Halloween night. He is committed to an institution under the care of Dr. Sam Loomis (Donald Pleasance) who believe that Michael is pure evil. 15 years after murdering his sister, Michael breaks out of the institution on Halloween and makes his way back to Haddonfield to continue what he started years before by stalking a group of high school girls, including the virginal Laurie Strode (Jamie Lee Curtis) who happen to be babysitting. The film is crediting for virtually creating the modern day slasher film and all the clichés that have come with it (though anyone who has seen "Black Christmas," which came out four years before this films knows differently). Still, John Carpenter gives us on hell of a ride with "Halloween." 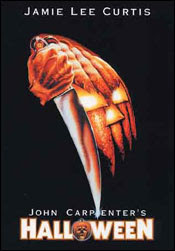 The tone of the film is foreboding to begin with and Carpenter does great at capturing the spirit of a small town Halloween. Once night falls in the film, Carpenter is a master us using color and contrasts to create tension and suspense. Michael's white mask is often seen in the background of a dark scene or room. The score is the best and most recognizable of any horror film in history and is an example of a score matching perfectly to the tone and purpose of the film. The final 20 minutes of the film-the confrontation between Laurie and Michael-remains one of the best chase/stalk scenes in film history. The music, the atmosphere, Curtis's acting--everything combines perfectly to create a heart-pounding climax. Often imitated, never duplicated, "Halloween" remains the paramount example of a slasher film done right.